Today we had the opportunity to have a couple of hours a senior mediator at work, to learn some tips and tricks about how to be better negotiators. I often find in the legal profession that negotiation is required at every step and in almost every case, no matter if it is civil litigation, criminal defence or immigration related. Yet, negotiation, the skills involved and the practice required is simply not appreciated or given the attention that it should. So having this opportunity to ask some questions, the answers and insight into which would help us in our daily work, was most welcome. In this post, I am going to record the key points from today’s discussion so it can be a place of reference both for me and any readers in future. Sometimes, we meet some one on the opposition and think, wow, person x has done such a great job. The aim is to try and be that person in all we do. In all negotiations. It is therefore important to keep in mind that the long term goal is to create a good relationship, as well as a good outcome from the case. The goal should not be short term success at the expense of a long term relationship. When we are in a situation where something is not looking well or going in the right direction, pause, take a step back and find that professional space that we can speak from. I find this especially important to remember – often, comments of questions that catch us off guard or are particularly difficult, may seem like a personal attack but it is important to remember that that may not necessarily be the case. We must remember to find space and take on a professional role, removed from our person, when entering into dialogue. How do you deal with a particularly competitive and aggressive party? I work at a smaller law firm that represents mostly minorities. I myself belong to an ethnic minority group and to top it off, I am female and young. These are not the typical characteristics of a Kiwi Lawyer and they certainly were not typical a few years earlier, when most of the now seniors entered te profession. This sort of comment, at the beginning of negotiations or dialogue, typically comes from players who have been in the field for longer than thou and it has the effect of utterly destroying any semblance of a levelled playing field. So how can we respond to it? How can we bring back some kind of control? Create an opportunity to pause this kind of destructive, competitive and pushy dialogue. Say “Can I pause this conversation” or “Can I pause you there” and then have a personal script ready that we can use – such as introducing ourself and taking a moment to explain who we are and what we do. The other person has just said that they don’t know us or our firm so take it as an opportunity to educate them on these matters. Ever been asked this question from a Judge? I have. What to say then? As this is now a judge that we’re talking about, and not another lawyer, we cannot take the same kind of response. The Judge is most definitely not on the same levelled playing field and does not need to negotiate with us. Nonetheless, we could respectfully say “Your Honour, is there anything I can provide you with that would help” or “Would it help if I explain” or “would you like to know more about us“. Of course, if the other side then agrees to hear more, we need to be quick and have the personal script ready. This trick can be used in a variety of situations and questions, to create a pause, an opportunity for us to take back control and show that us will not be pushed around. But to use it effectively, we must have scripts, questions and answers ready. Preparation is key to good negotiations. 1. Those who are competitive – they are fully focused on the outcome and have no interest in establishing or maintaining any relationship. Often, they are difficult to deal with and pose a challenge. But sometimes, we may also need to take on this approach on behalf of our client – for example, if the outcome is very important to the client or if we want to establish our client’s expectations and position at the beginning of a conversation (or anchors). 2. Those who avoid entering into any kind of dialogue. However, this is no necessarily a bad thing. Sometimes, people may avoid a particular issue because it is not the right time to discuss it or they don’t have all the information yet – so at that particular moment they may have no interest in having a conversation or any outcome in relation to that particular issue. 3. Those who are accommodating. Such people tend to be focused on creating relationships and therefore don’t have much success in terms of outcome. As humans, we are all accommodating to varying degrees. It is our nature to want to maintain good relationships and relationships are important to us. But this has the danger that if we are up against someone who is competitive, they will walk all over us. 4. This is the point at which we want to be – we want to be collaborative. This can be a win/win situation for all parties involved. 5. 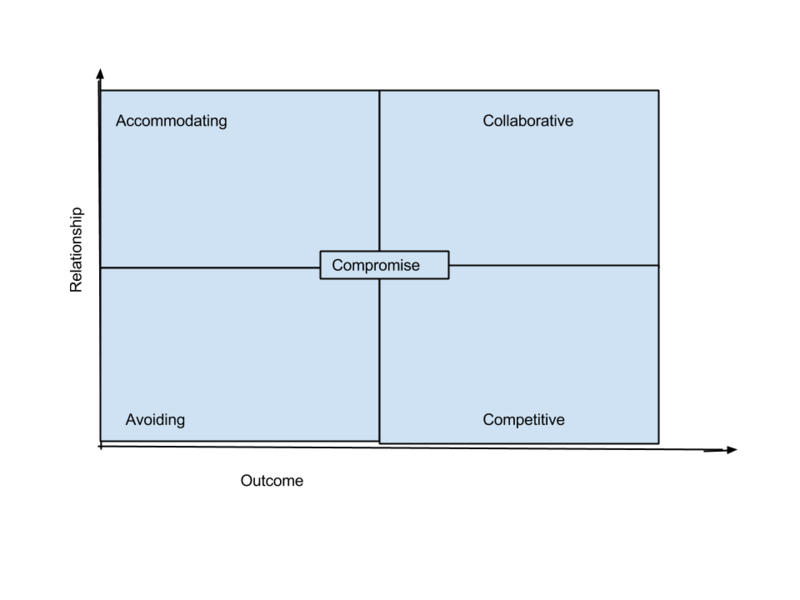 Then there is the middle area of “compromise”. Not a pretty word, is it? It’s not a pretty outcome either. Both sides feel a little unhappy with the result, a little dissatisfied. This is where one side starts very low and the other side starts very high and they, bit by bit, come closer to the centre. So in the end agreement will be reached somewhere in the middle. The problem with this is that the amount by which oen party may be willing to come up or down towards the centre is usually arbitrary and has no real reason behind it. In this situation, you should prepare beforehand by determining what the middle range may be and where on that middle range your client would like to be at the end. How to neutralise a strong approach? – “We can both do it this way, but it will not get either of us very far in this discussion.” Then add details of what you suggest instead. – At the beginning of the meeting/conversation clearly state what we hope to get out of this conversation. For example, after introducing ourself, we may something like “This matter is very important to my client and I just before we begin I would like to clarify that my client was looking at around x for this”. This is called an Anchor and it basically anchors or solidifies your position in the other person’s mind. It also ensures that the conversation will most likely revolve close to the figure you gave in that beginning statement. If you said that your client is looking at around $2million payout and the other person was silently thinking of beginning with $500,000 then they will have to re-think that and operate closer to the $2million line, unless they also come up with a counter-anchor, and come up with it fast. – Agree on how much time is put aside for this meeting, and how much time may be allocated to each issue on your list. – Instead of focusing on getting agreement on the matter as a whole focus on the individual parts instead and seek agreement on those bits. – Ask questions, digging deep, until we find a question which they have to say yes to – something that simply cannot say no to. From there, we can then build up. For example, we have previously come across a situation where the lawyer on the other side simply does not believe that our client has any arguable case and should not continue with the case. That lawyer is therefore annoyed and impatient that our client is continuing even though (in the lawyers view) our client obviously has no claim. To neutralise this hostile situation, where no negotiation is possible, it is important to see what that other lawyer may be faced with. Imagine, he may have a client who is having to pay him money and the end result may be that our client had no case but the client had to pay his lawyer anyway, so the lawyer wants and end to it as soon as possible. So, we could firstly acknowledge his frustration – his position that our client has no claim – then say that we believe, nonetheless, that our client does have a claim and then explain why. Point out that we believe his client faces risks of the litigation, because our client has an arguable case, and focus on those risks. For the moment, put aside the arguments about the merits of the case and point out that his client believes that our client has no case but we believe our client has a case, his client therefore faces risks, and this may be a good time for us to get together, maybe just the 2 of us, and discuss this. Once the lawyer agrees for the meeting, well, that is a whole different game – one that also requires preparation! Before any meeting, prepare, prepare, prepare. What does this entail? – Think what are we going to say? – What are the possible questions we could be asked? – What are our answers to those questions? – What is the best outcome for our client? – What is the worst outcome for our client? – What is the worst outcome that our client is willing to accept? – What if we can’t or don’t accept that outcome, do we have a back up option? 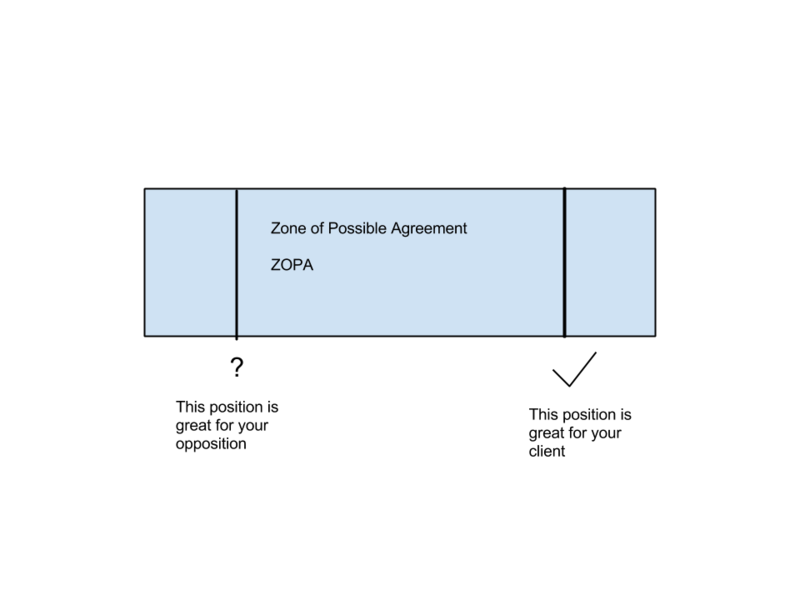 – Determine where the case is likely to settle at – the zone of possible agreement – and then decide where on this range our client would like to be best. Once we have this, we can then see where we want to start the negotiation at. This profession is one that deals with people, it is a relationship based world out here and it is important to maintain that relationship with our client. But sometimes we have clients who may not agree with the legal fees, the outcome of the case, the time spent, or any number of other things throughout the retainer. It is very important, for client and relationship management, to ensure that we keep our client’s updated through regular communications about how their case is progressing, and also about the costs to date. We can let them know that we have x amount of money in the trust account and the work to date has incurred time of y so we anticipate making an invoice for that in the near future. This kind of progressive approach is much much better than a reactive one, where the client has already begun to feel worried and concerned and we then must react to that. Remember, we can pause the client, summarise what we have heard, and check if we have understood correctly. This ensures that we have some written confirmation of the client’s specific instructions, and that the client has confirmed these are correct – which can be helpful reference point in future if there are any issues. When we have a client coming to us the first time, we don’t typically think – aha, now let us file a court proceeding for this matter straight away. No, we first think – okay, what are the processes that we can go through to achieve a good settlement for our client? This will include negotiations at every step. Negotiation is not about the law! It is about communication.